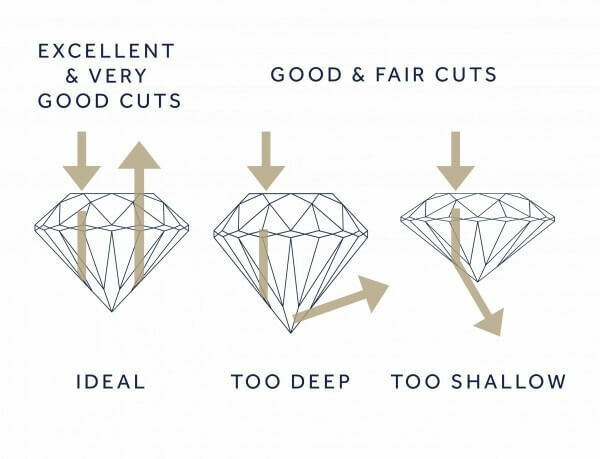 In Diamond Cut practices, there are certain significant factor components that must be put to consideration- if the perfect aesthetic and beauty potentials of the gemstone are to be retained. The importance of obtaining the right diamond table and diamond depths in diamond shaping, speaks volume of whatever personal satisfaction the end user is able to derive from that particular cut. Consequently, the ideal diamond cutters understands why they must be conversant with apt factor measurements and target consumer requirements. 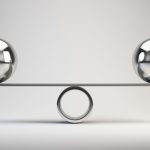 The adopted factor measurements contribute as essential elements of a diamond table and depths- which are the basic overall discussed components. 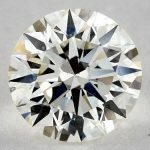 Why Diamond Table and Diamond Depths are Well-Discussed in Diamond Cut? Whenever you look in GIA or EGL diamond certificate, you’ll clearly see details about table & depths in the diamond image on the certificate. 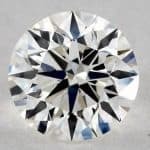 Diamond table and depths take center stage discussions, considering the fact that the physical diamond shape- which determines the beauty and ideal design of a shaped diamond sample- is largely affected by these two distinct characteristics. 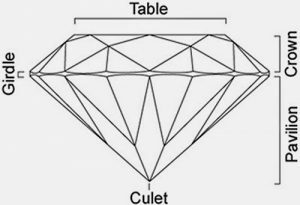 Note that since there are different diamond cut patterns (shapes), we would resultantly have a different ideal diamond table and depths dimensions. Diamond cut is the encompassing process that incorporates diamond table and diamond depths, as important determining factors. 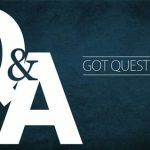 Hence, the emphasis has always been on the reasons why active and intending practitioners, are expected to understand the relevance of these components, to their line of business. Diamond table is the term used to describe the upper top facet of the diamond stone as you see here in the image. It is undoubtedly the largest facet of the gemstone- no matter how many facets the piece has-. It is also the part of the whole stone that plays the most important roles in characterizing its brilliance and light performance. The diamond table determines and carries out light ray refraction, as well as implementing the number of light rays and sparkle that is being visibly reflected. Hence, if the light performance is relatively not up to par, then it might have been a function of the table (although, this factor does not exclusively determine brilliance and light performance). 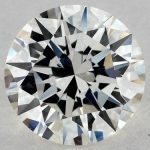 In diamond cutting, the table percentage is usually determined by calculating the presenting size ratio of the table, to that of the girdle diameter of the whole stone. Diamond depth, on the other hand, describes the resulting measurement from the lower bottom tip of the diamond to the diamond table top. In essence, the depth means a measurement of the height presentation of the diamond stone. Every diamond has a depth percentage which is calculated relative to the whole gemstone. It is calculated by finding the ratio of the depth to the width of the stone. 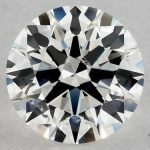 Gemologists and experts in diamond design modifications would readily identify the diamond table and depth features, as the reason why one finished diamond product looks particularly appealing than another- with similar appearance and composure effects. The reason for this is not far fetched, and it is because the physical shiny and sparkle appearances of any diamond cut sample, is as a result of its table and depth. 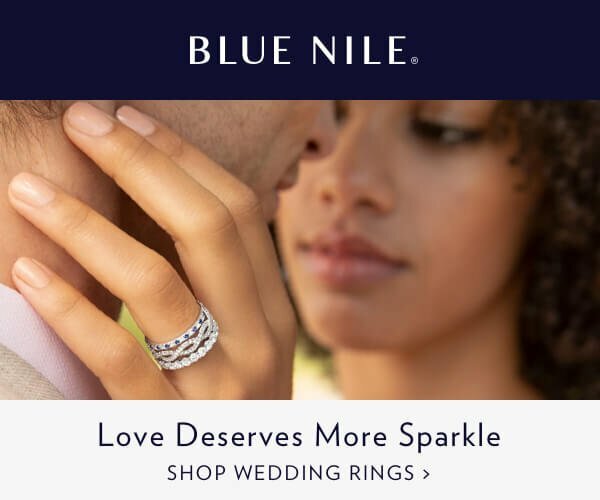 This explains the opinion that suggests that these two individual traits, reasonably affects the price value of displayed diamond wares. 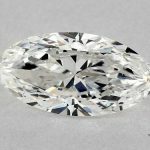 Now, since this is true, it is essentially germane that diamond gemstone users and stakeholders- especially those in the luxury markets, are well acquainted with what should make one diamond piece, price higher or lower than another. This trait refers to the ability tendency of the diamond to reflect and refract directed light rays that hit its surfaces. Its ability to perform this function may be determined by the disposition and number of its accompanying facets. The higher its ability to do this, the more it’s recognized relative value. Diamonds show response effects that are peculiar, and links to a kind of sensitivity to light and/or movement. This characteristic is very important in gemstone ornamental productions, and diamond manufacturers want to tailor their products to have an appealing massive light performance. The tendency of any finished diamond to display visible colored lights depends on the aptness and dexterity of its cut. A well-cut diamond disperses light rays into an impressive spectrum of viable light. The importance of diamond table and depths lies in the fact that these listed effects are well implemented by them. 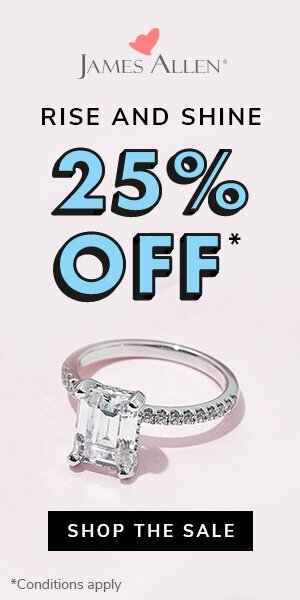 Consumer’s market choice of diamonds is affected by the type of cut (and shape). 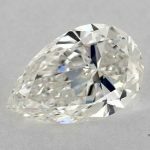 Diamond pricing is also largely calculated and determined by their cut features- of which the table and depth play significant roles. Diamond cuts are a considered factor in diamond price fixing, and regular diamond stakeholders know the importance of this. This is quite an effective way of determining what to expect aforetime- especially if the intending buyer seeks to work on a stipulated budget. For instance, table and depth percentage measurement are valuable tools, when diamonds of different carat size measurements are an option. This is because they have helped even supposed novices on the markets, in making the best choices that meet their specifications, and without them having to ignorantly pay more. However, the requirement for enjoying this benefit is having the required knowledge on how these things work. 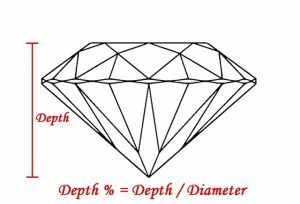 I hope this clarified what Diamond Depth & Diamond Table are, and also it gave you the recommended & ideal depth and table percentages for each round diamond cut, so you can tell next time you read a depth & table on a diamond certificate if they are 100% true, have any questions? Feel free to drop us a message through the contact us page.